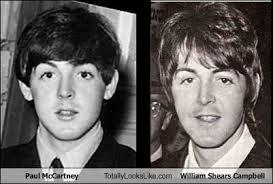 This story is in the news again today....The Paul is Dead Story started with a guy named Tom calling in to WKNR FM disc jockey Russ Gibb (the famous Grande Ballroom owner)..
Paul McCartney is alive and well, but a well-placed rumor in 1969 had some thinking otherwise. On September 23, 1969, 43 years ago, the Northern Star newspaper of Northern Illinois University published a story claiming that McCartney had been killed in a car crash a few years earlier and had been replaced by a look-alike. A radio station in Detroit picked up on the story and ran with it. Within a month, the story had gone global and Beatles fans worldwide were collectively scratching their heads. The intrigue led fans everywhere to search for ‘clues’ on album covers and in songs. A few of these included Paul wearing a black rose in the clip of ‘Your Mother Should Know’ from ‘Magical Mystery Tour,’ walking barefoot and out of step on the cover of ‘Abbey Road’ and appearing with his back to the camera on the back of the ‘Sgt. Pepper’ sleeve. There are, naturally, deep meanings behind these and the countless other ‘clues’ conspiracy theorists found. Most famously, one theory suggested that if you played the song ‘Revolution 9′ backwards, it sounds vaguely like “Turn me on dead man.” Try playing your MP 3 backwards and see what happens! Though initially amused by the story, McCartney finally decided to clear the decks. “Do I look dead?” he asked a reporter visiting him at his farm, “I’m as fit as a fiddle.” Good news for us all, Paul was just fine … still is for that matter, and still out there rocking!